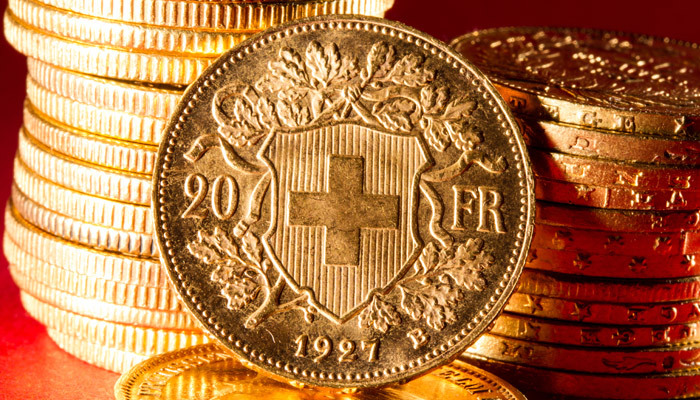 Home › 3) Swiss&Gold › 2014: Swiss Gold Referendum and Gold in Switzerland › “SNB Concerned”: Does a Yes to the Swiss Gold Referendum Imply an End of the CHF Cap? If the upcoming referendum “Save our Swiss gold” wins, then the SNB must increase gold holdings from less than 10% to 20% of its balance sheet. This possibly implies an end of the CHF cap. The referendum will take place on November 30th. According to the upcoming referendum “Save our Swiss gold”. The SNB should never be allowed to sell gold again. The gold has to be stored in Switzerland. Gold should represent at least 20% of the SNB assets. That the SNB has sold one ton of gold per day during five years? That 1550 tons of the people’s assets in form of gold had been sold for cheapest prices (between 300 and 500 US$). When the concerned minister was asked where the SNB gold currently is stored, he answered in parliament: “Where this gold exactly is stored, I cannot say, because I do not know, because I do not need to know and because I do not want to know”. With it the Swiss people will decide if the SNB should be obliged to hold gold with a minimum percentage of 20% of its total assets. Currently the SNB holds only 10% gold. With the weaker gold price this ratio has fallen to 7.8% in 2014. The link to the gold initiative. Until the end of Bretton Woods, the Swiss managed to accumulate large gold reserves thanks to continuous current account and trade surpluses. For years the Swiss and the SNB resisted the rather Keynesian mindset of the International Monetary Fund (IMF), and joined this institution only in 1992. IMF membership implied that the Swiss had to change their constitution: until 1999 the franc was officially bound to gold. In a referendum, leaders convinced the Swiss to remove this dependency. In the year 2000, the IMF intensified the “demonetization of gold” campaign that had started in the 1970s in the strong belief that the “New Economy” and the strength of the anchor currency of the global monetary system, the US dollar, and the newly created euro would be able to defeat any future supply-side and inflation issues. Many believed that the euro would be the garant of strong European growth given that even Italy could borrow at low rates. In a period of strong U.S. growth, relatively high interest rates and low inflation, the central bankers thought that it was a “barbarous relict” to hold gold. Even if officially independent of governments, central bankers suggested that government bonds were the better deal, because “bonds generate income“. 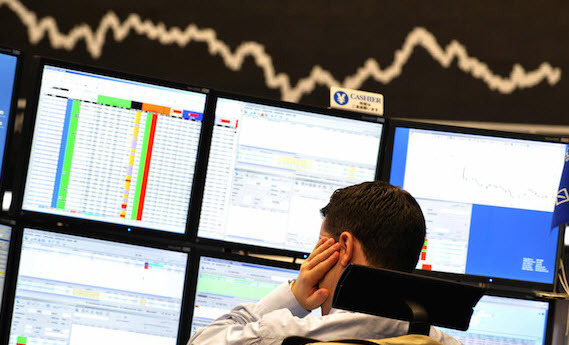 Many central banks, like the Bank of England or the SNB, sold masses of gold, and most of the proceeds were invested in bonds denominated in the newly created euro. Germans, French and Italians, however, decided to keep their big gold reserves, possibly to give the euro better credibility. Since the last gold sales in 2007, the Swiss have maintained the same quantity of gold. Despite the strong rise of gold prices between 2008 and 2012, the SNB never bought more gold. But people and central banks in China, Russia, India and other emerging markets purchased more. The gold price improved with higher oil prices, rising incomes and the demand from those “barbarous” countries. Many central banks had capital gains on gold thanks to those rising incomes in Emerging Markets. 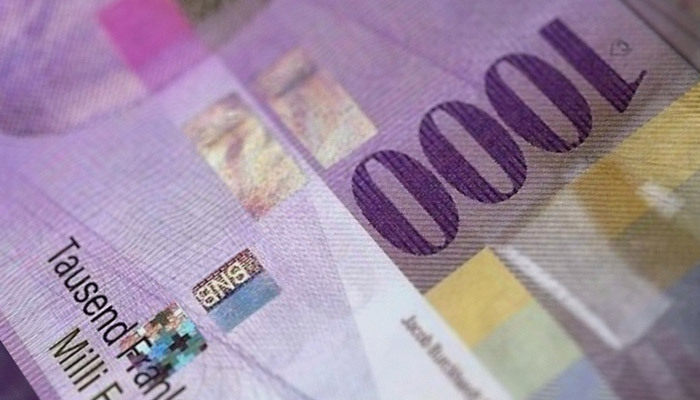 Between 2001 and 2007, the SNB made the Swiss cantons happy and delivered some billions of francs to prop up their finances. The gains were unfortunately not caused by strong asset management capabilities, but mostly due to gold price improvements and gold sales at quite cheap prices. For the proponents of the gold referendum, the SNB gold sales were the destruction of what their parents and grandparents achieved during the Bretton Woods period. As the year 2010 SNB results show, the remaining Swiss gold holdings prevented higher losses. Unfortunately, the quantity of gold was less than half of that from the year 2000; otherwise, gains on the gold price would have completely neutralized losses on fiat currencies. The percentage of gold holdings to total balance has fallen from 30% in the year 2000 (despite low weak prices!) to 10% in 2012. The referendum proponents want to raise it to 20%. Due to the fact that the gold price fell between 1995 and 2000, the SNB gold share was even 45% in 1995. Switzerland is not the only country where the gold share as percentage of central bank assets has strongly fallen: Germany had a gold share of 20% of total assets still in 2002 despite weak gold prices. 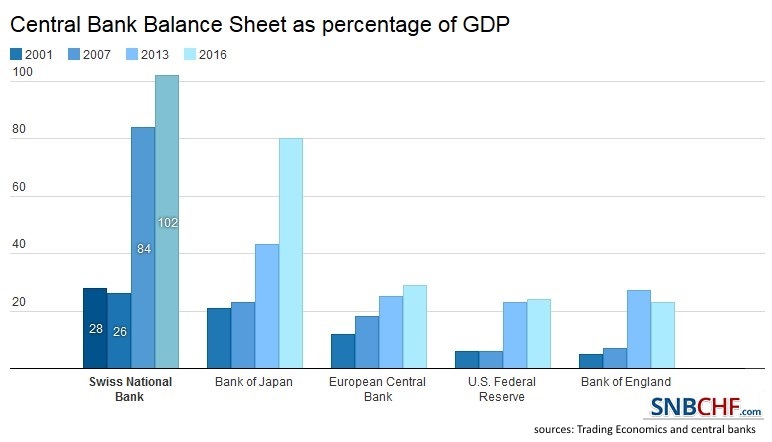 Despite Germany not selling gold, the explosion of the Bundesbank balance sheet with EUR denominated claims, called Target2, let this percentage fall to considerably under 10%. Why was the gold price so low in 1999/2000? 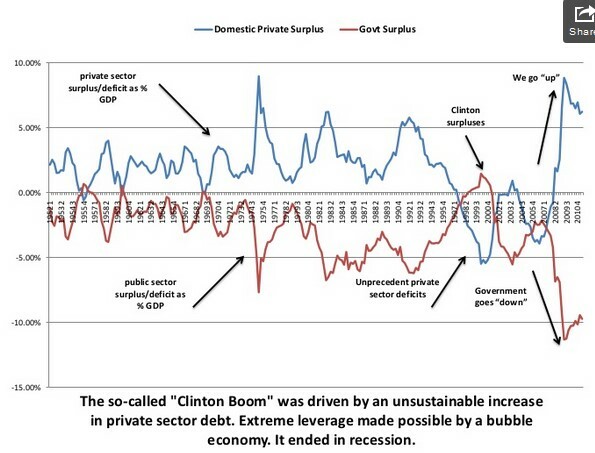 During that period, private spending and private debt went into two different directions, more private spending and private debt in the U.S. as opposed to less private spending growth and less debt in the rest of world. This helped to make US GDP grow more quickly than growth abroad. Full details about low gold prices in 1999 and 2000. 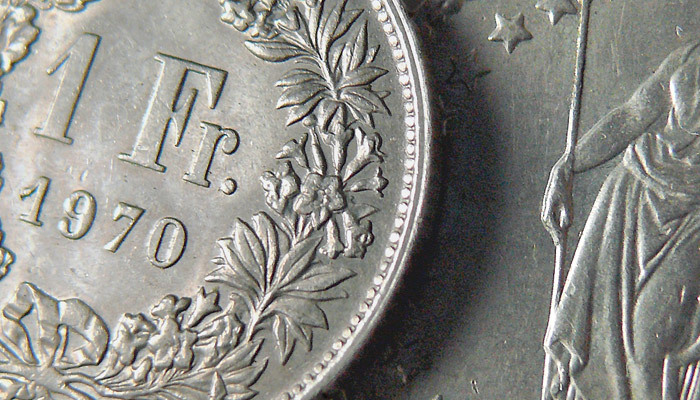 A referendum “Yes” implies a Swiss franc appreciation, end of the franc cap? Either double the quantity of gold holdings, (i.e. buy it expensive after selling it cheap). That would be around 1783 tons of gold. Or a mixture of both, like selling euros and dollars for the total of around 68 bln.$ to buy gold.The initiative gives the SNB five years to raise its gold share to 20%. 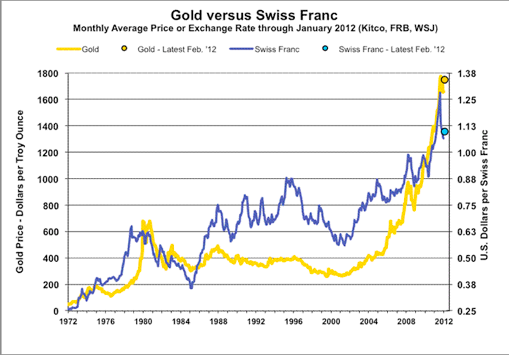 In the first case, the gold price should rise and with it the gold-correlated Swiss franc. In the second option, the Swiss franc should rise even more. Previously the franc was correlated to gold mostly thanks to low Swiss inflation and the (formerly) strong monetarist ideas inside the SNB. Now the CHF is correlated to gold thanks to global trade surpluses produced by Swiss multinationals that correspond to rising global gold demand. The Australian dollar is a similar currency that profits on Chinese and global growth. Both the Swiss and the Australian currencies are often used as proxies for Chinese expansion, because they provide assets related to China without having the obligation to invest directly in Chinese companies. While CHF represents the safe variant of global growth thanks to a high savings rate and current account surpluses, the Aussie is the risk-on variant with a higher propensity to consume, high interest rates, current account deficits and a negative international investment position. 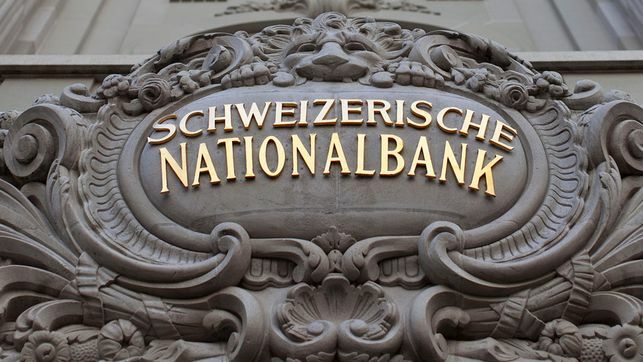 A spokesperson for the SNB said the central bank has “considerable concerns with regard to the monetary policy implications of the demands in the initiative“. Buying so much gold would destroy the “ability to do independent monetary policy” and implicitly the EUR/CHF peg. Gold generates no income as opposed to bonds (see above). The gold price has a “far higher volatility”. Effectively Quantitative Easing provoked a strong improvement in the gold price and the reverse movement, the “tapering” a strong weakening. Based on this these two strong price movements, SNB officials claim that gold is too volatile and too risky. In the current 0% inflation environment, the SNB still has popular support for the euro peg, this could change when inflation rises again. Many Swiss are very adverse to inflation and this is one reason why many Swiss private investors actually possess gold. During the early SNB gold sales, Swiss private investors were “officially” invited to buy the gold that the central bank sold. SNB does not protect the Swiss against strong inflation any more, investors should do this themselves if they think that there is such a risk. This, however, leaves the poor without protection. We understand why the SNB has concerns with the referendum. But looking back at cheap SNB sales of expensive gold or the financial crisis of 2008, the Swiss farmers’ shrewdness and gut feelings might be able to beat the mathematical models of (central) bankers once again. IMF membership of Switzerland was also not understood in that article. Gold is a real-time currency all on its own now that bullion values are free to float. This market valuating feature combines the virtues of debt-free store properties with the scalable liquidity of any currency in history. Weight would be the unit of account and the denomination that moves from account to account, whether the weight be real or virtual (and fully backed). Debt-free store of value meets real-time digital liquidity. There is an easy solution to the volatility in the price of gold: the SNB could adopt the same valuation methods as the Federal Reserve Bank and the Bundesbank which do not mark to market their gold reserve. This means that gold is valued at purchased price. This would make sense for the SNB, particularly if it is barred from selling gold as stipulated in the initiative. The recent years have shown that gold is very volatile. The reason is again the Fed. When they decided to reverse course in June 2013, Emerging markets did not have the cheap money supply from the U.S. anymore. Instead central banks of these countries kept money tight, which increased costs for businesses, for credit and personal spending. This slowed them significantly that hindered their wage and spending expansion, oil and commodity prices. Goldbear …. the SNB could do what you suggest but the rate of change is an important consideration for the trade value of gold , given the fragile state of the debt based fiat system. Best to let the market morph that one , IMO. Don’t want any sudden exoduses from the fiat system. The market is charged with the struggle of bringing gold to a level where it “finds it price” for the rationale of monetization in what will eventually culminate into a monetary Yin-Yang of debts and assets that circulate in a symbiotic relationship of stability. We need to inflate a deflated Yang. Just add assets and stir gently … that’s all. It is light that comes out of darkness, is it not ? Rather than the political approach taken by the Swiss , I think the Canadian approach by way of the market is better and safer. Take a look at this recent release by the mint and pay special attention to the face (legal) value of the coin versus the bullion content. You’ll see a complete departure from the norm. This one could make for good circulation. It’s NOT an investment , simply a good trade of debt paper for debt-free metal. 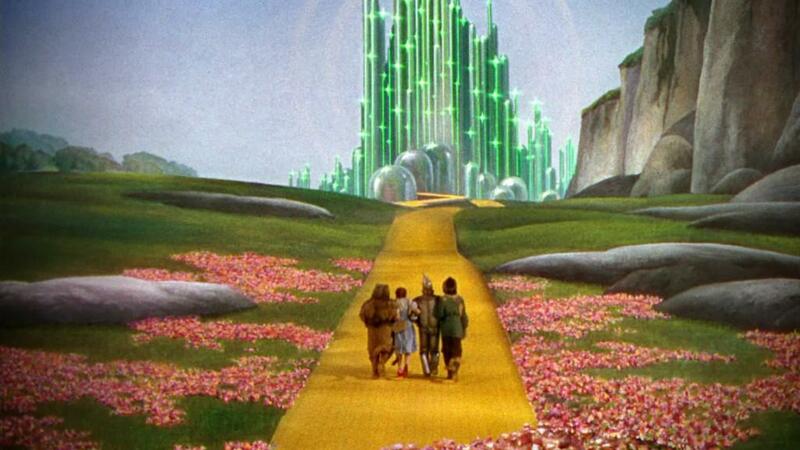 It’s also “down in the grass” where serpents are wise. I have my fingers crossed that the people of Switzerland will be the first to rebel against the quantitative easing, currency devaluing, gold manipulating bankers and politicians in the West. My entire life until recently I have had instinctive respect for the Swiss Franc. Everyone respected it as a benchmark. Let’s get that situation back and hope the Swiss vote YES. foxenburg I’m a gold bug …. a 21st century real-time gold bug, as a matter of fact. I think the political approach of the referrendum is far too abrupt and overt for the currency market’s good. A more sublime organic method via the economic model would make much more sense and we’re now seeing this with the leading edge coming from the Canadian mint. This is not an investment approach to minting coin…. this is a monetary approach, primarily lodged in the face (legal tender) value of this coing and the fact it’s debt-free. It is only bullion that circulates (debt-free) that can allow for the purging of existing fiat based debt and have it banished to the nothingness it was created from. $50 of debt for $50 of debt-free metal. We must be as wise as serpents yet as gentle as doves. MichaelGlenn1 Sorry, I don’t buy your method at all. Incidentally, I buy UK Mint silver £20 coins, which sound similar in proposition to your Canadian ones, ie they have a legal tender value of £20 and they are made of sterling silver – but you can’t escape the fact that they only contain about £4 worth of silver at best. They are more comforting than a wad of paper, but that’s hardly the point. Abrupt and overt suits me fine! Yours, with respect, foxenburg. foxenburg MichaelGlenn1 Taking a top-down and very overt approach to bullion reintroduction risks a flight from the fiat/debt system. I’m not cheer-leading debt-currency. I’m a gold bug but I’m also a 21st century real-time gold-as-currency advocate who appreciated rate of change. We don’t want any crashes of the legacy (debt) system. It would be incredibility painful. This is the reason we see the USA so staunchly defending the USD in various ways (yes, they include war) because at the end of the day, what we will end up with is a symbiotic yin-yang of circulating debts and assets … a hybrid. has failed and went to its intrinsic value: zero!